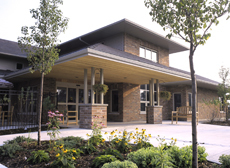 The comfortable design and features of AON Long-Term Care Homes set them apart and make them a great place to live. 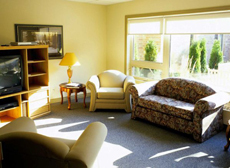 Our LTC residences have many spacious private rooms with large windows, private en suite bathrooms and other special features to promote an independent lifestyle. Enjoy private courtyard gardens and walking areas, lovely atriums and fireside lounges, and cozy courtyard cafés. Our many lounge and "common" areas are comfortably designed and decorated to feel like home and to give you and your family plenty of places to sit and visit, to participate in our frequent activities and community events, or to simply relax and enjoy some quiet time. Bright, airy rooms and open spaces built to provide a comfortable, home-like environment. Wellness services promoting an holistic balance of mind, body and spirit. Friendly, highly skilled staff who understand the needs of our residents and who view them as family. Attractive living areas which include private gardens and walkways in a lovely village setting. All situated close to amenities. Family centred and inter-generational programs designed to promote community involvement and well-being. Plenty of spacious private rooms with oversized windows, en suite washrooms, and added features. Private dining areas for family get-togethers and a lovely courtyard café. Constructed both to AON's high standards for safety, security, and design and to the exacting standards of the Ministry of Health. Delicious home-style meals with flexible wake-up and breakfast times. A full range of complex health care and dementia care services. AON LTC Homes are located in the village of Millbrook, just minutes south of Peterborough, and in the village of Tweed, a short distance north of Belleville, Ontario.